Crowd #6 (Hazelwood) copyright by Alex prager. Crowd #9 (Sunset Five) copyright by Alex prager. M+B is pleased to announce Alex Prager: Face in the Crowd, an exhibition featuring new large-scale color photographs of elaborately-staged crowd scenes and a film by the same name that explore the notion of the individual within the masses, the boundary between public and private space and the psychological complexities of human interaction. This body of work was created specifically for Prager’s first major solo museum exhibition in the United States at the Corcoran Gallery of Art in Washington, D.C. that opened in November 2013. 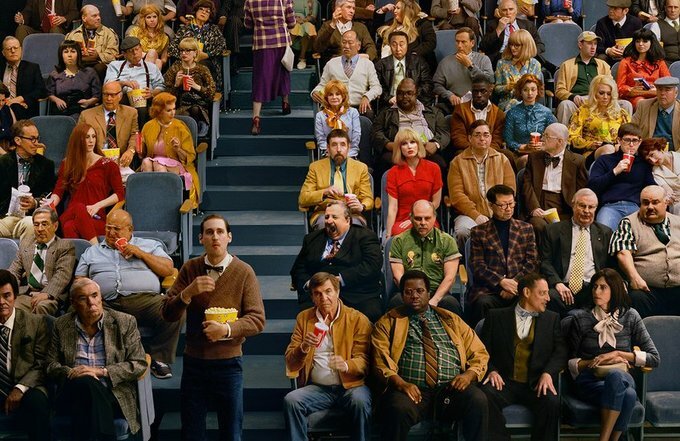 Alex Prager: Face in the Crowd will run at M+B from January 25 to March 8, 2014. For ten years, Prager has staged imaginary scenes for her camera—dream worlds in Technicolor, rife with tension and melodramatic fictions. Deftly blending archetypes from post-war America, her images have re-enacted and burlesqued media portrayals of women, drawing from classic Hollywood movies, fashion advertising and icons of documentary photography. Face in the Crowd expands on her tradition, but in her most ambitious and complex way to date. Blurring the line between fiction and reality, Prager directed the actions of hundreds of costumed actors on specially constructed sets creating congested public spaces including an airport terminal, a City Hall lobby, a beach and the Sunset 5 movie theatre. Densely detailed and shot from seemingly impossible vantage points, the work enacts psychological narratives of private and public revelation, repulsion, fear, personal safety and the desire for basic human interaction. The stories of the various characters within these crowds culminate in a new film, featuring actress Elizabeth Banks. Together, the film and the photographs uphold a portrait of the individual within the complexity of the larger crowd. Prager’s focus on this dynamic can be traced to specific influences: silent films like Charlie Chaplin’s Modern Times; photographers Martin Parr, Garry Winogrand, Bruce Gilden and Helen Levitt; the darkness and the humor from Roy Andersson’s film Songs from the Second Floor; and the well- known children’s books Where’s Waldo? Throughout Face in the Crowd, each character maintains their own agency within their cinematic circumstances. In exploring the notion of identity and the performative aspects of public life, Prager has created a universe where the crowd that gathers is the true spectacle. 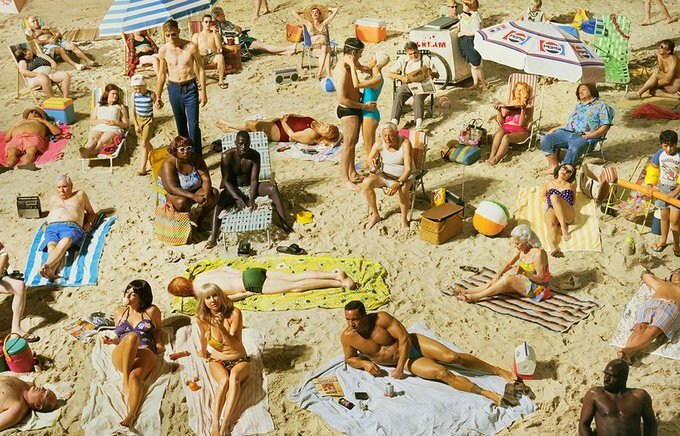 Alex Prager (b. 1979, Los Angeles) is a self-taught photographer and filmmaker who was inspired to take up photography after seeing the color images of William Eggleston. 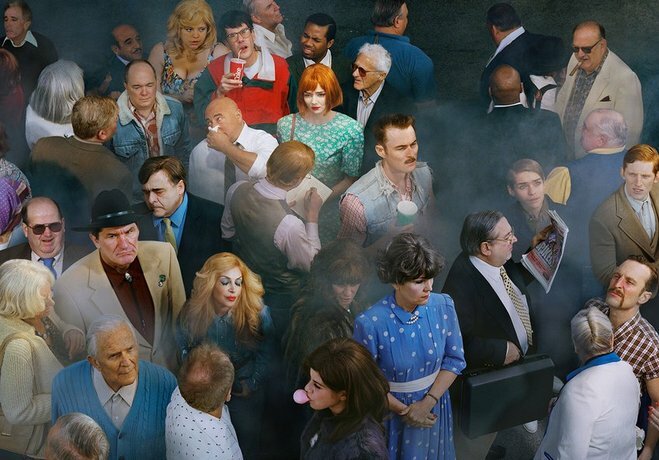 Her work has been exhibited in galleries and institutions worldwide, most prominently in Alex Prager: Face in the Crowd at the Corcoran Gallery of Art in 2013 (Washington, D.C.), Alex Prager: Mise-en-scène at SCAD Museum of Art in 2013 (Savannah, GA), Alex Prager: Compulsion at FOAM Museum in 2012 (Amsterdam) and the New Photography 2010 exhibition at the Museum of Modern Art (New York). Major awards include the Paul Huf FOAM Award in 2012, the London Photography Award in 2006, and Prager’s short film Touch of Evil, commissioned by The New York Times Magazine, garnered her a 2012 Emmy Award. Prager’s work is held in the permanent collections of the Museum of Modern Art (New York), Whitney Museum of American Art (New York), San Francisco Museum of Modern Art, North Carolina Museum of Art, Cincinnati Art Museum, Moderna Museet (Stockholm), Kunsthaus Zurich, among others. Alex Prager lives and works in Los Angeles. Alex Prager: Face in the Crowd will run at M+B from January 25 to March 8, 2014. For more information please contact Alexandra Wetzel at alexandra@mbart.com.